https://www.youtube.com/watch?v=aDqed3Pb7OE ** Presented by: Paquette Productions Centrepointe Theatre Sunday, November 05, 2017 at 7:00 p.m. Tickets & more info… ** Close your eyes and imagine the unique sound of Johnny Cash, as if it were live and for the first time in the early 1960’s. Now open your eyes and experience this great singer songwriter recreated on stage in the hit musical tribute, The Man In Black, A Tribute to Johnny Cash. The Man In Black offers a retro look, sound and feel into the performance of American Icon Johnny Cash. The show delivers the raw prowess that made Johnny Cash a 20th century pop culture figure, while capturing his ability to cross musical genres, age and ethnic barriers to bring a classic sound that is immediately recognized. The show also features hits made famous with June Carter Cash and goes beyond the look of a younger Cash to feature his music right up to his death in September of 2003. 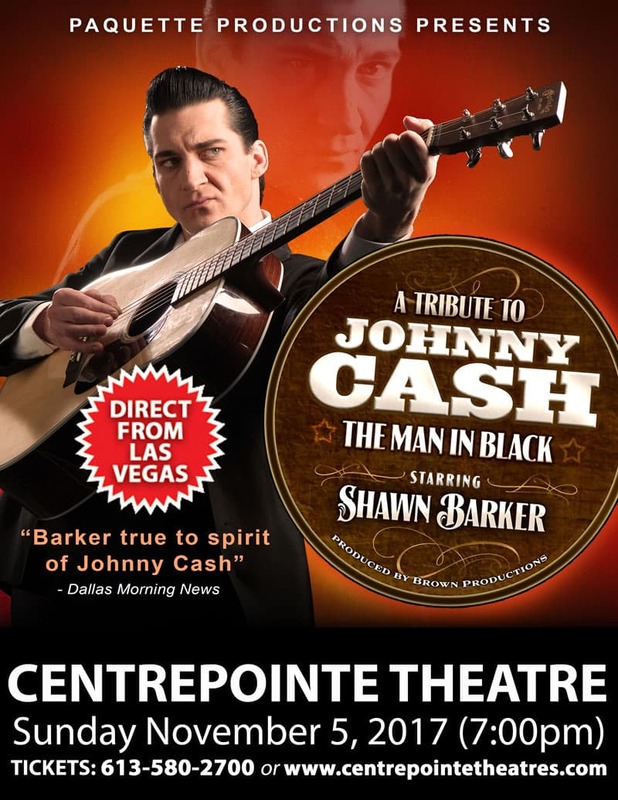 Widely acclaimed by the general public and critics alike the star of The Man in Black, Shawn Barker, is considered as the pre-eminent Johnny Cash tribute artist as well as an accomplished musician and singer songwriter. Having an uncanny resemblance to the younger Cash, his portrayal is stunningly accurate and remarkably authentic.